Christmas gets earlier and earlier and we the customer are expected to spend more and more, get into debt and forget about healthy eating, the new year had hardly started when Easter eggs appeared in some shops. Now we have Veganuary a marketing campaign loved by big food companies. Profit is at the centre of all these campaigns, not the consumer. Further to your extensive coverage of Brexit. After the historic vote on the Brexit deal and the no confidence vote we are left with the question of what to do next to resolve the Brexit issue. Parliament cannot agree a way forward and therefore democracy now demands that the people decide the outcome of Brexit. That brings us back to a People’s Vote, but what should the question be? We know the Prime Minister’s deal is not acceptable, the 15th January vote proved that. We know no deal is very bad, we hear that from so many sources. We know the EU has said repeatedly they are not willing to re-negotiate the deal. This means the unrealistic option of renegotiating with the EU should not be presented to the public since it not likely to be possible and even less likely to result in a deal which is acceptable either to Parliament or to the electorate. Therefore, the only options within the UK’s control are: remain in the EU or leave the EU with no deal. This is most clearly not a re-run of the 2016 referendum when all manner of deals seemed possible. This is a very different question. It is a clear choice between leaving the EU with no deal or remaining in the EU. 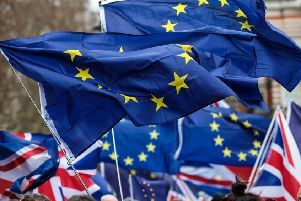 The EU has indicated that it would agree to extend Article 50 for such a People’s Vote to take place. Whichever outcome you prefer, please help your country now by writing to your MP and telling them you want a People’s Vote. It’s been a busy year and a half for all of us in the NSPCC Schools Service, and with the help of our volunteers we visited 67 primary schools in Leeds in the last academic year alone. This means that, between September 2017 and July 2018, we spoke to 20,555 children locally – and we’re delivering more sessions all the time. Throughout the course of every visit we help children identify who they can speak to about what worries them – it can be a teacher, a parent, or a member of the wider family, to name just a few. We do this because we know how important it is for children to understand that there is always someone to turn to, no matter what they’re feeling. Because we never want a child to feel alone, or isolated, particularly when they are worried, upset or being hurt. We would like to thank each and every one of our volunteers, who help deliver these very big messages to children in a fun, interactive and engaging way that is always age appropriate. Their work is vital to our aim of keeping a whole generation of children safe, and for us to keep reaching as many children as possible we at the NSPCC are in desperate need of more schools service volunteers in Leeds. A happy letter - not many nowadays! WISE - Wetherby in Support of the Elderly is a brilliant organisation. A six page A4 newsletter is issued every month. For example, since giving up driving two and a half years ago - my decision - volunteers help in transport, locally, to Wetherby, Boston Spa and Clifford. Charges are very reasonable eg two friends and I go to chairobics on a Friday morning. Must be over 50 people every week. Excellent people who organise it. Volunteers help if needed. Ladies in wheelchairs, and those with a ‘help dog’ - lovely. Tea, coffee, biscuits or cake, supplied by Morrisons, an adjoining tea room £2! Journey to and from Wetherby Social Centre from home £1.50 each. The world is warming. Climate chaos is already impacting people and wildlife in the UK. Our birds, animals and nature are in rapid decline. And the UK would probably still be the ‘dirty man of Europe’, if it wasn’t for EU laws which improved our air quality, protected nature and prevented companies flushing raw sewage into our seas. A no-deal Brexit will leave the UK without the environmental rules we need, and nobody to enforce the ones we do have. Without adequate environmental protections and a strong watchdog to enforce them, wildlife in the Pennine Moors would be at an increased risk. It’s only thanks to EU laws that short-eared owls, Eurasian curlews and other wildlife have thrived, protected from polluters. Progress on Leeds’ air pollution problem could also stall. Not only that, but political desire to get the economy moving will likely lead to pressure to lower standards to secure quick trade deals. However they campaigned on Brexit, Yorkshire’s MPs must come together to urge the Prime Minister to take no-deal off the table. Our health and environment depend on it.